The resistance of the Eritrean people led by Ras Woldenkeal against the Abyssian conquest in 1878, Kentebai Hamid against the Egyptian conquest , Hadgham Basah against the Italian occupation in 1891, and the uprising of Dejazmatch Bahata Hagos in 1894 opposing Italian rule, are well Documented historically by Bereketeab 2000, Killon 1991, Pateman 1990 and Paice 1994. The Eritrean Opposition against the Italian colonization also is documented in Tarik Hzbi Eritrea. 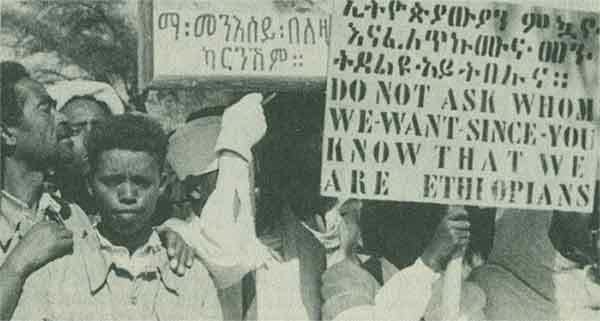 Additionally the protest against colonialism during the Italian occupation contributed greatly to the rising of Eritrean nationalism and to the birth of the Eritrean political movement after the defeat of Italy by the British-led Allied forces in 1941. Although the Eritrean people being liberated from the Italian colonialism the British administration did little to free the Eritrean people from the Italian system. According Sherman (1980) during the first few years of the British occupation, disputes between Eritrean and Italians were still heard before Italian judges. Sherman (1980) adds that the British maintained the Italian law of racial discrimination and Protected Italian property which was contrary to the promise given to the Eritrean people. Trevaskis (1960: 51) also states that the Italian system remained for the most part unchanged and no Native courts were set up in Asmara until 1947. On 5th of May , 1941 Mahber Fikri Hager Eritrea (MFH)(Association for the Love of the Country of Eritrea) was formed to represent the Eritrean society in its daily interaction with the BMA through co-ordinating the relationships between the British Military Administration (BMA) and the Eritrean society. Gebremeskel Woldu (pro Ethiopia for the unity), Woldab Woldemariam (pro independence movement) , and Ibrahim Sultan (pro independence movement) were among its founder (Berketeab 146). (Makakis ). However, in 1944 the rift between the pro Ethiopia for the unity of Eritrea with Ethiopian and the pro -independence movement was exacerbated. This was happened when Haile Selasse sent Eritreans from Ethiopia to rename it as Yehager Fikr Mahber to instrument in its campaign to annex. This was resulting in the resignation not only of Muslim members but also of Christians such as Wolde-Ab- Wolde Mariam (Sorenson,305). Eventually, this caused for splitting of the Mahber Fikri Hager. The first signs of the split in the MFH became clear in 1944, when UNIONISTS dominated the association and the independentists started to abandon it. On November 22-26, 1946, a meeting was held in Bet Giorgis, Asmara,(locally known as The Waa’la Bet Gherghis the meeting of Bet. Giorgis) to resolve the conflict between the pro Ethiopia for the unity of Eritrea with Ethiopian and the pro -independence movement but it failed, this was because of the Unionist wing of the MFH rejecting Wold-Ab’s proposed compromise which gave a good opportunity for the unity between the Yehager Fikr Mahber and the unionist section of the Mahber Fikri Hager. After the meeting, the Unionist leader Gebremeskel Woldu who was one of the founder s of Mahber Fikri Hager was replaced by Tedla Bairu, the reason for Gebremeskel Woldu replacing was due to of the compromise agreement reached between the unionists and independence supporters. The Independence Progress Party IPP also known as the Liberal Progressive Party (LLP) was established in Adi Kheih for the creation of an independent Eritrean government. Ras Tesemma Asberom was elected President, Dejazmatch Maascio Zewede as Vice-president, and Grazmatch Seyoum Maascio as Secretary –General. Its aim was for the creation of an Independent Eritrean government free of any European control. As can be seen from Fig. 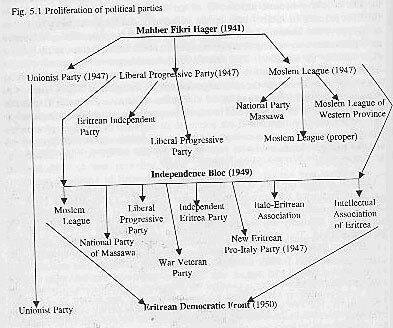 1 below, 1947 the following three political parties split from Mahber Fikri Hager: The Unionist Party , Moslem League, and Liberal Progressive Party. The UP was officially founded on March 21, 1947 by changing its name from the Association for the Union of Eritrea with Ethiopia changed its name to the Eritrea-Ethiopia Union Party. In July 1948 the Moslem League were regrouping in Asmara and formed a coalation with a Kebessa political party the Liberal Progressive Party (LPP). Ibrahim Sultan and Seyoum Masscio, the LPP leader, then drafted a document and sent it by registered airmail to the UN. The document, in the name of 70% of the Eritrean population, rejected the union of Eritrea with Ethiopia. By 19477 Colonel Negga Haile Selassei, the Ethiopian Crown's representative in Asmera not only co-ordinated Unionist activity but was involved in bribery, intimidation and violence (Sorenson, 1991:305). "...I also have in me the courage to die for my political beliefs, for the cause of liberty of my country, and for the genuine interest of my brothers and sisters." Woldeab Woldemariam in Hanti, Eritrea, Issue#, August 22, 195. There was also five assassination attempts on Knzmaa Berhzanu Hmdyn who was one of the founder of the Moslem League on 03/12/1946. We should have no association whatsoever with anyone in the Independence Bloc. If there is any betrothal involving anyone with a family that has any association with the Independence Bloc, the betrothal should immediately be called off. If anyone in the Independence Bloc is having a wedding, we should see to it that we do not attend the festivities or lend any of the traditionally obligatory support. If anyone in the Independence Bloc or his family member dies, we should keep away from attending their funeral. If there is no one to bury them, however, no more than four people to carry the casket and three people to dig the grave should accompany the dead to the cemetery. This should be done only to avoid the outbreak of communicable diseases. NO PRAYER FOR THE DEAD SHOULD BE OFFERED BY ANY CLERGY; nor should any of the customary assistance (debes) be offered to the loved ones of the deceased. Any clergy whose sympathy lies with the Independence Bloc must be removed from his parish. No believer should take confession, accept the sacrament of baptism or receive any blessings from such a clergy. 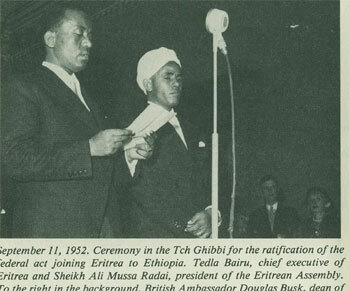 It was regrettable that by 1950 the IB had failed to achieve its goal as the Liberal Unionist Party led by Dedjazmatch Abrah Tessema, who supported a conditional union after receiving assurances from Ethiopia that the Eritreans would be left alone to manage their own affairs, and the Independent Eritrea United to Ethiopia Party (previously Independent Eritrea Party) split from the LLP. The Liberal Unionist Party led by Dedjazmatch Abrah Tessema, split from the LLP. Sheikh Ali Radai leader of the National Party of Massawa who opposed Ibrahim Sultan’s leadership also split afrom the ML and established a separate party, the Independent Moslem League and joined the unionist camp (Iyob, 1995:77). In addition, when Idris Mohammed Adem and other groups of the nobility from the feudal Moslem landowners realized they were dominated by the serf emancipation movement seceded from the Moslem League. Following this, Kentebai Osman Hidad of Rora and Diglel Gelani of Beni Amer approached the Four Power Power Commision, pledging their support for a union with Ethiopia. 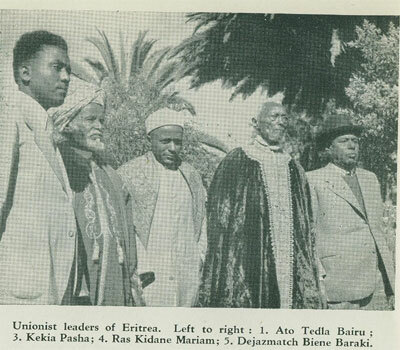 Generally, In the late 1940s, these political leaders of ML who split from League joined the Unionist party, instead of working together with the Ibrahim Sultan for Eritrean independence. As a result of the disunity of the political leaders and splitting within the Independence Bloc, finally the Independence Bloc changed its name to the Eritrean Democratic Front (EDF), 1950s. [see fig. 1]. On 2 December 1950 the UN adopted Resolution 390A(V) which provided that Eritrea Would become a federation with Ethiopia on September 11, 1952.